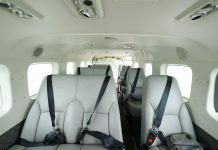 As the Hai Au Seaplane service attests, travel is not just about the destination, but the experience of getting there. Emily Petsko and Julie Vola fly by seaplane to Halong Bay. 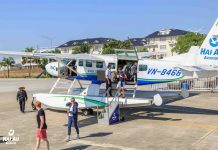 Ducking their heads at the entrance, the first eight passengers of the morning file into a cramped Cessna Caravan plane at Noi Bai International Airport. In the event of an emergency, life jackets should not be inflated inside the aircraft, the pilot calls back from the cockpit. After all, you wouldn’t want to get stuck in the doorway. A middle-aged couple shoots each other nervous glances as the plane accelerates down the runway. Taking off is the easy part, though. 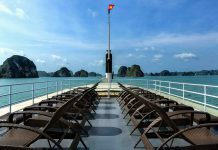 It’s the landing — smack dab in the heart of Halong Bay — that’s a bit trickier. Tourists traveling to the UNESCO World Heritage site typically go by car or bus, but now another option exists. 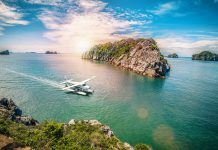 Hai Au Aviation, which took off towards the end of 2014, established the first and so far the only commercial seaplane service in Vietnam. After completing its first full year of operations in 2015 and attracting mostly retired and honeymooning couples from Europe and North America, the airline is now hoping to target a new market — expats and local Vietnamese. On the one-hour flight from Hanoi to Halong Bay, passengers won’t get coffee, a plastic-wrapped lunch or their choice of cheesy action flick on the small screen. But they will get excitement and unparalleled views. “I want to set the expectation that this is more of an experiential adventure product rather than something that is too expensive and only for the rich,” says Hai Au managing director Dinh Thi Thu Trang. The brainchild of Tran Trong Kien, the founder and current CEO of Thien Minh Group, Hai Au’s mother company, Kien was inspired by the Australian seaplane service at Rose Bay in Sydney. 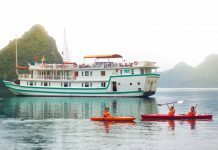 Through his travel agency, Buffalo Tours, he played a significant role in bringing kayaking to Halong Bay 20 years ago. 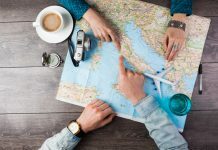 Now he wants to instill in Vietnamese tourism the concept of transportation as an integral part of the sightseeing experience. 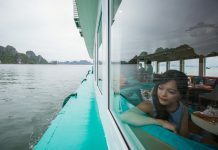 The result is a flight from Hanoi to Halong Bay that includes a 15-minute scenic flyover (starting from US$275 or VND6.1 million one way), but customers can also opt for a separate, 25-minute scenic tour of the bay (US$99 / VND2.2 million). 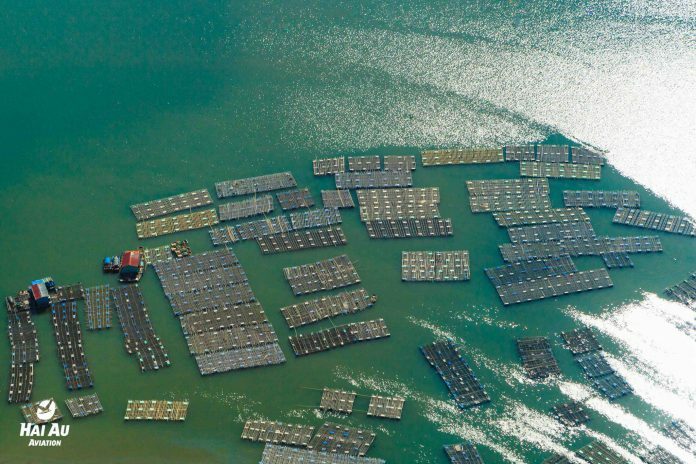 Good weather permitting, the water landing off the coast of Tuan Chau Island is remarkably smooth. The aircraft glides across the water to a ramp leading ashore, where passengers can board a golf cart to their hotels or cruise ships. But the impression that landing on water is easy is an artful deception. “It’s like night and day,” chief pilot David Radford says of the difference between landing on land and water. Radford explains that it takes a long time to feel comfortable with water landings because the approach is largely dependent on wind direction, and water isn’t able to absorb the impact. The two captains both hail from Canada, world-renowned for its seaplane services. Four Vietnamese co-pilots are in the process of being trained to someday go it alone. One co-pilot has a background as a historian and diplomat, and another was among the first Vietnamese to climb Mt. Everest. “I think our pilots have a lot to offer in terms of their stories,” says Trang. 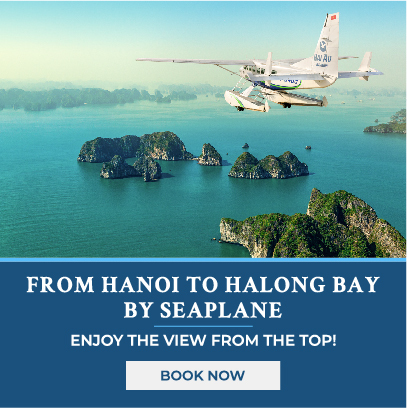 A typical Hai Au flight from Hanoi to Halong Bay reaches an altitude of about 900 meters (3,000 feet) above sea level. During the scenic leg of the flight, the aircraft drops down to 100 to 150 meters. 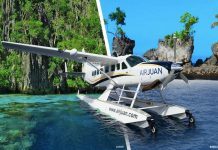 Compare that to the average commercial airliner’s altitude of between 9,000 and 12,000 meters, and it’s evident why the seaplane is such a coveted mode of transportation. On a clear day, the details of the landscape come into sharp focus. Motorbikes chug along narrow paths, farmers toil in the fields and, upon arriving in Halong Bay, massive ships leave trails in their wake like slugs on a pavement. From above, the Red River Delta weaves a breathtaking tapestry of lines, shapes, and angles in varying shades of green. Its fields and ponds, cordoned off in neat sections, seem to stretch in patchwork perpetuity. 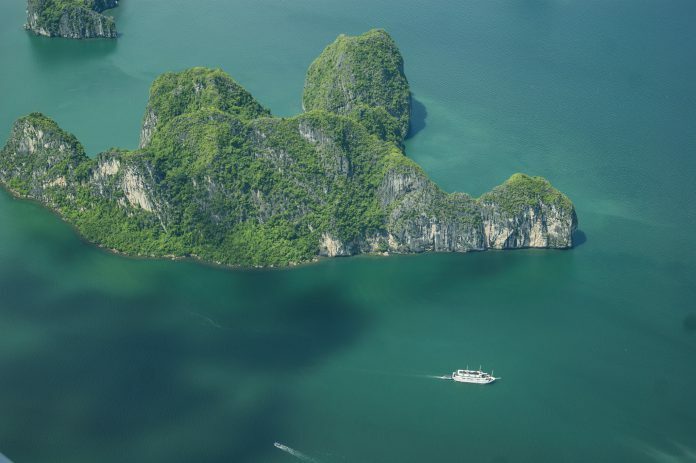 But the symmetry is eventually interrupted, quite abruptly, by a wilder backdrop of turquoise waters and jagged peaks. 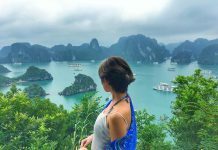 If the area surrounding Hanoi can be compared to a cubist Picasso painting, then Halong Bay is surely a Dali with its surreal, dreamlike landscape. 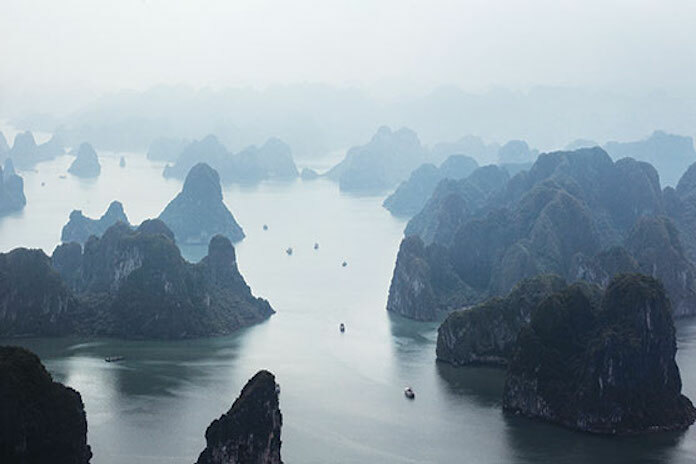 Halong Bay, which literally means “descending dragon”, somehow appears even more immense from above. Radford, who has been with Hai Au since its inception, has made the journey countless times. Yet the thrill of seeing those peaks has not fizzled out yet. “I see something new every day,” he says, whether it be a fishing village, uninhabited island or karst peak. 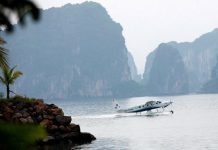 While Hai Au is the first commercial seaplane service in Vietnam, it builds upon a long national aviation history that can be attributed in no small part to French colonialism. In December 1920, a French pilot flew one of the first seaplanes in Vietnam from Hai Phong to Hanoi and landed just off West Lake. Three years later, a French sub-lieutenant and two Vietnamese engineers made the first non-stop flight from Ho Chi Minh City to Hanoi, which took a whopping eight hours and 30 minutes compared to the two-hour flight passengers enjoy nowadays. By 1923, Indochina had 60 landing strips. The French built and operated two seaplane bases between 1946 and 1954, which served as a recreational outlet for the military. One was on Hanoi’s West Lake, and the other was situated at Bai Chay in Halong Bay. Perhaps the most iconic photo from this chapter of aviation history is an image from March 1946 of President Ho Chi Minh and French Commissioner Jean Sainteny aboard a Catalina seaplane en route to Halong Bay to meet with French military officials. The Vietnamese leader seems to look on sternly, almost disapprovingly, as Sainteny takes a large puff on a pipe. Jump forward to the early 1960s and war had descended upon the nation. The area now known as Noi Bai Airport served as the main base for the North Vietnamese air force. Vietnamese aircraft took off from the base to intercept US fighter-bombers that had been launching an aerial attack on Hanoi and surrounding areas. 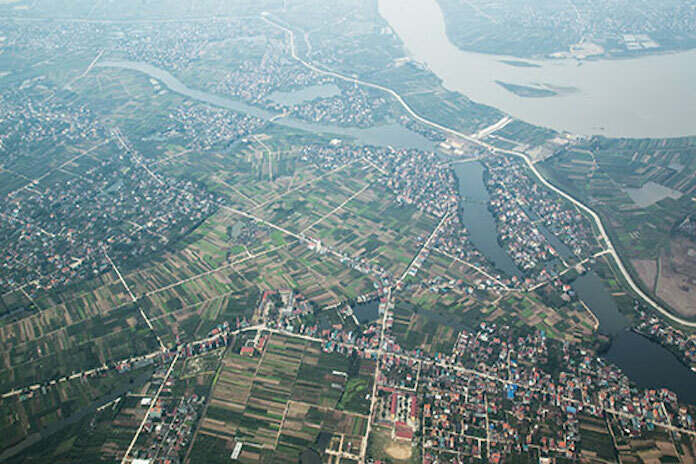 “The airspace over Noi Bai Airport has witnessed some of the most violent air wars of the 20th century,” according to an Hai Au informational recording that has not yet been used during flights. 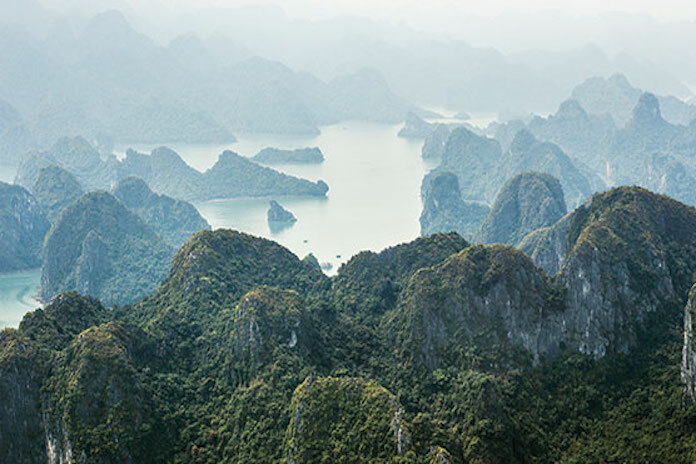 For Hai Au Aviation, the low-flying trip over Hanoi and Halong Bay is not just a scenic pursuit — it’s also a history lesson. 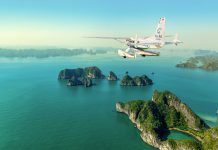 The seaplane service marks a larger trend in the continued development of Halong Bay. Yet going forward, Hai Au wants to expand its services and offer flights to other destinations. 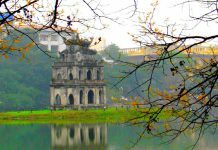 The airline will begin offering trips to Ninh Binh this summer. 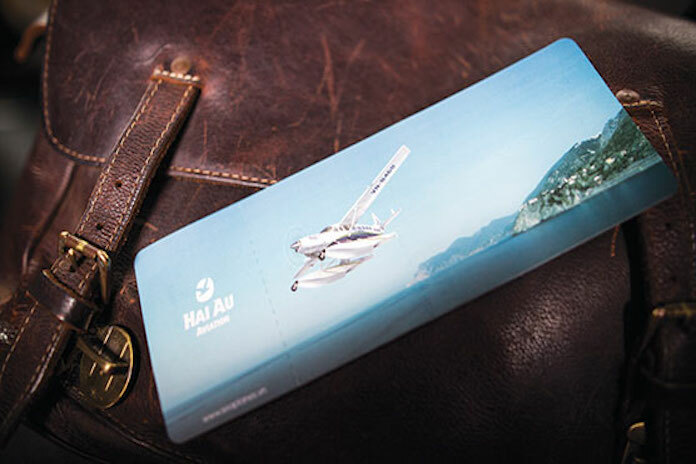 Last year, Hai Au served more than 5,000 passengers, and it hopes to double that number in 2016. On our trip to Halong Bay and back, that was certainly how we felt. It was spectacular.